The St. Johns River State College Foundation has partnered with Crescent City Boyz ll Men Mentoring Project, Inc. to provide graduating high school seniors an innovative opportunity to give back to the community while earning higher-education scholarship dollars to use at SJR State. Through the Boyz II Men Seniors Mentoring At-Risk Teens (S.M.A.R.T.) program, a component of the Boyz ll Men Mentoring Project, participating high school seniors can earn $20 in scholarship money for every hour they spend mentoring boys in grades six through eight. Seniors are required to commit to mentoring at least one hour per week and can earn up to 50 hours of service eligible for scholarship dollars. Additionally, participants will earn one hour of community service for each hour of mentoring provided. Once the seniors have enrolled at SJR State, they can use their scholarship dollars for books, tuition and fees, transportation, food, clothing, computer equipment and more. In addition to scholarship dollars earned through the partnership with SJR State, S.M.A.R.T. seniors will receive assistance with the college application and financial aid process as well as career planning and guidance. “Topics covering a wide variety of academic and other educational interests -- such as workshops for program participants and parents about options for higher education and SJR State programs -- will also be provided through our partnership with the Boyz II Men Mentoring Project,” said Tingle. The scholarship opportunity is limited to students who will attend SJR State on a full-time basis immediately following their high school graduation. Students are required to have successfully completed the requirements of the S.M.A.R.T. program, meet all of SJR State’s admission requirements and complete the Free Application for Federal Student Aid (FAFSA). Gerald Watson, president of the Boyz II Men Mentoring Project, said, "The S.M.A.R.T. 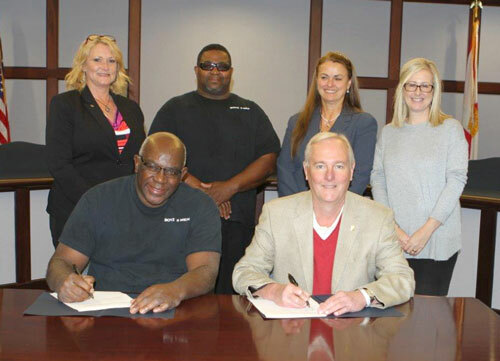 program’s partnership with SJR State is a win-win-win for all parties. First, it's a win for the middle school boys, because it provides them with role models in their relative age range whom they can relate to and look up to. It's a win for the senior mentors, because it provides them with an opportunity to earn dollars for college while donating volunteer time to the young men. And finally, it's a win for SJR State, because through the College’s partnership with us, another vehicle to provide higher education to deserving young men in the community is provided." Established in March of 2012, the Boyz II Men Mentoring Project is a nonprofit, faith-based program whose mission is to teach and demonstrate the principles of manhood to young men in grades five through 12, inspiring them to develop into productive citizens and to make a positive contribution to their families and community. In partnership with the Putnam County School District, the program includes an after-school component for middle school boys and an in-school program at the elementary school. Founded in 1970, the SJR State Foundation is a nonprofit, direct support 501(c)3 organization of St. Johns River State College, whose mission is to support the growth and development of SJR State in ways that are beneficial to its students, faculty, staff and campus facilities. Governed by an independent board of directors composed of professional, business and civic leaders who are committed to higher education, the SJR State Foundation plays an essential role in the growth of the College and its service to the communities of Clay, Putnam and St. Johns counties. Crescent City Boyz II Men Mentoring Project President Gerald Watson, left, and SJR State President Joe Pickens, right, seal the deal for a partnership that provides graduating high school seniors an innovative opportunity to give back to the community while earning higher-education scholarship dollars. Back row, left to right: Mechele Higginbotham, Crescent City High School principal; Vincent Oliver, Crescent City Boyz II Men Mentoring Project vice president; Helen Muir, Putnam County School’s assistant superintendent for curriculum and instruction; and Caroline Tingle, SJR State vice president for development and external affairs.